Basil or Sweet Basil (Ocimum basilicum) is a common herb grown in many gardens and on many farms. It is great for many different types of dishes, can be dried, frozen, and made into favorites like pesto and basil lemonade. We have recently planted numerous basil plants of a few varieties in our plot out at the farm. We currently have both sweet basil and cinnamon basil. Personally, I have purple basil as well! Basil grows best in hot, dry climates which makes it a perfect plant for this area of the country! Basil can also be grown indoors in pots and even in basements under fluorescent lights. Basil can be used as a companion plant for many crops, especially tomatoes, to influence flavor. Basil can also attract beneficial insects. Basil plays a huge role in a great event happening this weekend around Knoxville—Pesto Festo! Here is a little summary about what the event will entail! The 2012 Pesto Festo will be the 5th Anniversary of this white tablecloth farm-to-table event hosted by Slow Food Knoxville. This year the festival celebrating the simple tastes of various pestos will take place at Riverplains Farm in Strawberry Plains, Tennessee on Saturday, June 30th from 5pm until 10pm. Purchase tickets at www.brownpapertickets.com or at the Market Square Farmers’ Market on Saturdays through June 23 at the Market Booth. $35 for Slow Food members or $40 for non-members. Children ages 5-12 are $10 and children under 5 are free. There will be live music, kids activities, a pesto contest, bonfire, pesto tasting and a farm tour before dinner is served at 6:30pm. The menu will feature Italian inspired cuisine with a decidedly Southern flair. Pesto Festo is a ZERO waste event, so please bring your own place setting and come prepared to carry out your own trash. We will have bins for recycling. We would like to thank Three Rivers Market for graciously providing the shade tent this year. *Slow Food Knoxville’s own dilly beans and garlicky dill pickles. *Bread baskets featuring Hot Mama Soup’s blue ribbon buttermilk biscuits, cornbread muffins and various other VG Bakery’s breads. Served with Cruze Farm butter and Slow Food Knoxville’s own strawberry jam. *Red Barn’s roasted beets and Riverplains goat cheese salad with salty roasted pecans and vinaigrette. *Caprese salad with Cruze Farm mozzarella. *Hot Mama Soup’s tomato basil bisque. *Zucchini “pasta” with roasted red pepper pesto (a fun “faux” food with zucchini ribbons as the “noodles”). *Slow Food Knoxville’s own pesto sausage, Riverplains cheese grits and okra ragout. *Pasticcio al forno with pesto and creme fraiche made with Riverplains eggs (a crustless egg tart). *A variety of desserts, including scratch made marshmallows from Java, Cruze Farm ice cream and Slow Food Knoxville’s own buttermilk pie. More information can be found at http://slowfoodknoxville.com/. Basil is one of my favorite crops that we have on the farm and is so versatile in many different types of dishes. I hope to continue experimenting with basil and using it in new ways. The interns noticed some bad looking peppers in the garden today, and asked me what it was. I had seen this on our peppers last year, but didn’t remember the cause of it. A glance back at my notes showed that this was sunscald on peppers, caused by lack of foliage on the plants. Just like us, fruit burns when it is exposed to direct sunlight. This damage makes the fruit unmarketable. What causes sunscald? Something, it appears, is hindering good leaf coverage. This could be a lack of nitrogen, or leaf drop due to a disease such as early blight or bacterial leaf spot, or prolonged wilting. We will have to investigate this further–tomorrow we will look for leaves showing disease symptoms, and rogue these out. We may have to apply copper (CHAMP WG) or Serenade for protection if diseases are found. This week will be hot, so we will have to make sure that our plants are getting enough water! 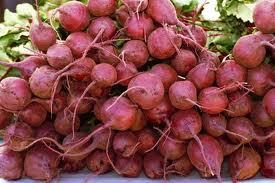 There are as many ways to cook beets as you can think of; microwaved, roasted, boiled, or sauteed. One good recipe that I’ve come across in the past is Roasted Beets with Feta, a very simple recipe with a lot of flavor and nutrition to brighten up your day.